I first learned about Feline Instincts while doing research on behalf of my cat Buddy that was suffering from periodontal disease at the time. He was an older cat and his gum and teeth problems continued to get worse – to the point he was taking steroid shots every 6-8 weeks. When the vet diagnosed him with a diabetes condition, I started looking for answers on my own. 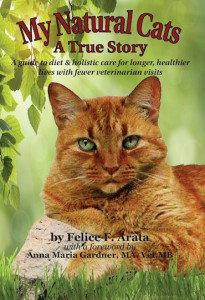 The research led me to the believe that what was needed was a low carbohydrate cat food that did not contain grain. I found your website during my searching and decided it was worth a try – even though he was a very old cat with lots of health problems. I did not know how old Buddy was when we got him as he was a full grown cat at the time. However, we had him for nearly twenty years. As I said earlier, by the time I found the Feline Instincts website and food formula he was not very healthy. However, when I stopped giving him daily insulin shots and started feeding him Feline Instincts food for cats, he improved almost immediately. He lived a much higher quality of life during the next two years on the formula. We estimate that he was nearly 20 years old at the time of his death.